How Well Do You Know Your Arborist? Bad Pruning = Lost Trees! As we travel around the Dallas area treating landscapes with our Soil Building program, we get to see a lot of good and bad maintenance practices. Once a storm comes through, it’s pretty easy to see which trees had proper care and which didn’t. It’s always heartbreaking to lose a large established tree. Sadly, many of the recent tree losses could have been prevented with proper feeding and pruning. While we’re not a tree care company, our soil building program and fertilizer treatments do help the health and vigor of your trees. When we’re on properties, we’ll often take a look at the trees to assess overall condition. We get it: Expert tree pruning and care can often seem expensive. Yet, the damage and losses caused by a large fallen branch or entire tree are far more expensive. What is it doctors will always tell us? Prevention is the best medicine. We know it can be tempting so save a few bucks and hire the guy down the street with a truck and a chain saw to trim your trees. If only it were that simple! 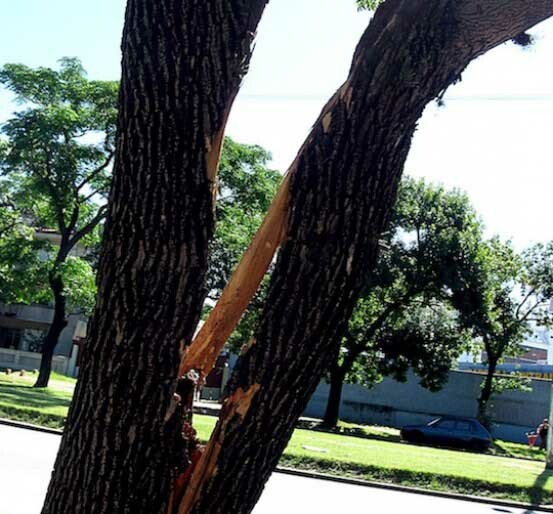 Unfortunately, untrained individuals can do a lot of permanent damage to your trees and you probably won’t even know it. Would you hire a person with no professional training to fix your plumbing or electrical? Probably not. It’s just as important to hire experienced professionals to care for your landscape and your trees. Both are important investments that add value to your property and beautify your life. What can happen when you hire the wrong person? Improper pruning: Cutting branches at the wrong place can cause tree wounds that will not heal properly, allowing for a variety of pests and diseases to enter the tree and cause decline or death. Over-pruning: Pruning too many branches, “thinning”, or distributing the canopy weight improperly can lead to a tree that becomes unstable. It may look fine to the untrained eye, but one strong gust of wind can often prove otherwise. You can’t put branches back on once their gone…and you can’t replace a fully grown tree. Inability to diagnose, pests or hazards: Anyone can own a chainsaw. That doesn’t mean they understand tree physiology. It’s always best to have an experienced ISA certified arborist inspect your trees annually to look for pests, diseases and decay. Here at Soils Alive, we can help inspect your trees for these issues. But, we also work closely with qualified tree care companies to handle pruning and sensitive tree issues. Caring for your trees doesn’t involve just pruning: You also have to manage water and nutrients to keep them strong. Never fertilized your trees? Then it’s a good time to start. Like everything else in the landscape, trees must be fed. A good general rule is to feed in spring and fall. If you are on our Soil Building program, we offer you a deep root tree fertilization injection of organic fertilizers that are fed directly to tree’s root systems. Vigorous trees are better able to withstand storms and pests. Need a suggestion for a local, qualified tree care company? Give us a call for a recommendation.